Retiring NBN Co chief executive Mike Quigley sent the following email to all NBN Co staff this afternoon, following the appointment of Ziggy Switkowski as NBN Co’s executive chairman. It has been announced this afternoon that Dr Ziggy Switkowski has been appointed Executive Chairman of NBN Co. I would like you to join me in welcoming Ziggy to the company. We have known one another for a good many years and you can be assured that with Ziggy at the helm NBN Co will be in good hands as the company makes the transition to meet the objectives set by the new Government. The role of Executive Chairman is that of a full-time office holder who typically not only leads the Board and but also takes a hands-on role in a company’s day-to-day management. As such, today will be my last day at NBN Co. While our achievements have been many, we have also encountered some well-publicised setbacks – most notably in the rollout of the FTTP Access Network. It is certainly true that some of our Delivery Partners have not been able to scale their activities as quickly as we had hoped and this part of the rollout is behind where we would like it to be. However, as a matter of principle I have never believed that the solution to this problem was to spend more taxpayers’ money than is required for an efficient network build, even if doing so may have made life a bit easier for management and myself. Rather, I would prefer that we take the time to calmly establish sustainable new construction models to add the construction capacity that we need. As it turns out, there are hard-working contractors and subcontractors who are prepared to work for a reasonable rate and ensure they have the right people in the right place at the right time. We have been bringing more of these companies on board in recent months. I thank them and all our many other commercial partners for their efforts. Overall – and despite what you may read in the newspapers – we are also still largely on budget. Attempting a business plan that looks 30 years into the future is always daunting, but everything we have learnt over the past four years gives me confidence that our forecasts for costs and revenues are realistic and achievable. In fact, if you account for the changes in scope of what NBN Co is required to deliver, the long term forecasts in our latest draft Corporate Plan are little different from those in the original 2010 Corporate Plan. All of the hard work of the past four years will provide a solid foundation as the company transitions to a more flexible mix of technologies in order to deliver on the new Government’s policy directives. 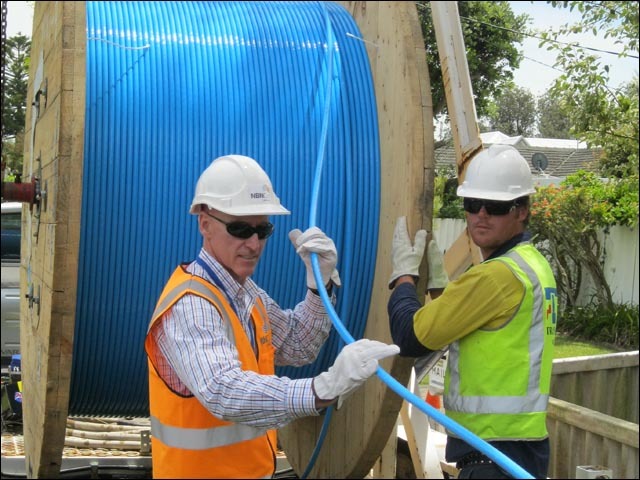 Undoubtedly there will still be many challenges ahead, but the addition of Fibre to the Node to NBN Co’s suite of technology solutions will allow the NBN to be built more quickly and at less cost to the taxpayer. Finally, I would like to thank each of you for your hard work and dedication that has helped the company accomplish so much over the past four years. We have taken a policy vision and turned it in to a successful wholesale telecommunications company with an ever growing base of satisfied end users. We have laid the foundations for better telecommunications for an entire continent for the next 30 years. It’s now your job, under the leadership of Ziggy, to build on those foundations. I am immensely proud of your achievements and grateful for your friendship and counsel over these past four years. I look forward to watching your successes in the future and to signing up for my NBN service as soon as it is available in my area. A gentleman with much more class that his detractors. Always the dignified gentleman, Mike. You can hold your head high as a lot of ordinary Australians hold you in high regard regardless of what the MSM spins. Thank you for all your hard work and good luck for your future. A great rundown of all the things that NBNCo has achieved in the background while everyone obsessed about the premises passed. A lot has been achieved, let’s hope that foundation gets something other than a house of straw built on it. Just an ideologically driven down hill slide for Australia’s essential ubiquitous communications infrastructure from now on. Thank you Mr Quigley. I hope you enjoy your retirement and know that you have earned the respect and appreciation of many. And this might be an opportune moment to thank all the staff, past and present, at NBNCo for their efforts to achieve the vision. Exactly the type of dignified, honourable and positive farewell letter I’d expect to see from Mr Quigley. He can retire with pride, given all that has been achieved at NBNCo over the four years he was at the helm. He’s right when he says “its quite a list” of accomplishments. That’s interesting Mike personally knows Ziggy, and gave him a very warm welcome too. I’d like to believe him when he says that with Ziggy at the helm, NBNCo “is in good hands”, but then he followed it up with “to meet the objectives set by the new Government” (shouldn’t be hard for Ziggy, given the second-rate NBN objectives the new Government has set). i think history is going to look back on Quigley’s achievements during his time at the helm of NBN co favourably. I expected class from Mike Quigley and he’s delivered in spades. Over the past four years, as the then opposition screamed blue murder and stamped their feet. Mike Quigley has trodden a delicate and subtle path through the political quicksand. He leaves the job unfinished, but with out deepest gratitude for getting it as far as he has. He’s been a remarkable public servant in the finest sense of the term.